Like a lot of people, I enjoy making lists. So I completely swoon over the Listography series, put out by my one of my favorite book publishers, Chronicle Books. 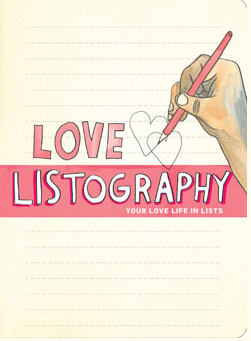 And I have a copy of Love Listography to give out to a lucky commenter! Just leave a comment on this post -- about anything at all. Try to convince me that you should win, write me a poem, or just say hi, whatever. The winner will be picked at random on Tuesday March 8 so get commenting! I'm pretty much a compulsive list maker. It drives my boyfriend crazy. I have made at least one list a day (my to-do list for that day) since like, freshman year of high school. Sometimes the list has many many things on it, sometimes I want to write and write about my goals for the next five years, or my favorite memories. Sometimes it just says, "relax, drink plenty of water, shower" etc. Natalie -- I think it's a woman thing : ] Maybe it won't drive him so crazy if you just make a list of why he's so great? Steffi -- that's so soon! Happy (almost) birthday! Kacie -- they make great creative writing prompts, huh? Hope you're enjoying Prague! Kelci -- me too! It's sort of an esteem booster, I think. As an obsessive-compulsive planner, I have depended on lists to organize my daily life. From homework outlines to weekend to-do lists, I bullet point my thoughts to make dauntless tasks seem manageable. However, as a college senior preparing to graduate, I have learned that each step of my life cannot be written neatly in my planner. Now I am trying to lay aside my pen and paper to live more spontaneously. For me, my lists and planners serve two purposes: not only can I keep the many threads of my busy days from becoming unraveled, but I can also have a record of the scribbled tapestry of essays, exams, novels and outings that make up my weeks and months. Lists are essential! As the great Coco Chanel once said "Gentleness doesn't get work done unless you happen to be a hen laying eggs." Making "to do" lists remind me that I am no hen. I am almost positive I would never have survived college without post-it notes and I am the proud owner of list pads with designs for every holiday and season. 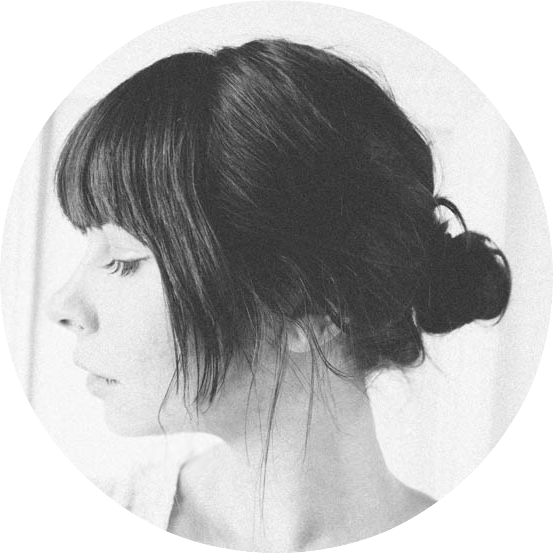 BTW your blog is adorable and very fun to read. I am definitely adding it to my list of ones I check often! I'm not really a "list guy". Celeste -- I covet thee as well. Lexi -- live spontaneously with me soon! Please? Jenny -- I wish we could have just written lots of lists for 313. Actually, by the end of the quarter, most of my reading summaries were lists. Cheers! And love your blog. Ariana -- Great quote. Of course. You're adorable. Joy - Haha, that's true. At one point I started a habit of sticking post-its to the inside of my bedroom door to remind me to do things. It was almost covered by the time I realized it wasn't even enough...there had to be lists, too. Tim -- love the haiku. Here's a poet. I prefer to make my lists on 3X5 colored, ruled, post its (and so probably shouldn't win the book) but I thought this would be a good opportunity to pledge support for your blog since I belive this to be the ultimate goal of the give away. While I have never known you as well as I would have liked, we are similarly quirky people and I really love your posts. Your photography is beautiful and looking through your latest is one of my favorite internet study breaks. I have a link on my bookmarks toolbar. Charity -- You are so right. If you don't win this I will have to find a special way to say thank you : ] I'm planning on doing these every weekend and I have such a neat stockpile of prizes...vintage clutches and jewelry...cool coffee table books. There's lots ahead. I will only write my lists in blue pen or .5 lead mechanical pencil. FACT. Lori -- that's funny. I remember in high school I absolutely refused to write anything in blue ink or in pencil. Only black ink. I've lightened up...at least regarding the ink. But my scrawl is pure chicken scratch in lead. HI BRIDGET!! Nate and I miss you so dearly! I love that you blog because it is always so fascinating. I miss talking to you in real life though, so we need to fix that soon. Also, regarding lists, they are so great. I always feel accomplished checking things off. Today I had eight things on my to do list, but I never really got around to any of them, so I added a few things that I did so to my list so I could check them off... back cupcakes: check!